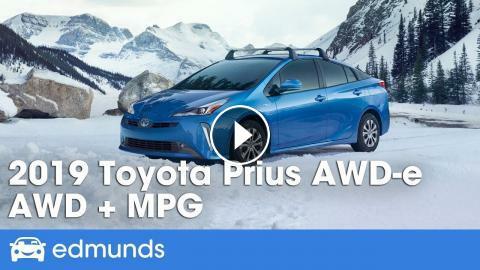 Edmunds Senior Reviews Editor Mark Takahashi made the trek to wintry Wisconsin to find out firsthand if the new 2019 Toyota Prius AWD-e is a worthy addition to the lineup. It promises the kind of traction and assurance needed for snow and ice, and from his initial findings, the new Prius meets those goals. Q: How is the Prius AWD-e different from the regular Prius? A: Toyota added an electric motor between the rear wheels to provide power from 0 to 6 mph. If wheel slippage is detected, the motor will kick in at speeds up to 43 mph. The lithium-ion battery has also been replaced by a nickel-metal hydride unit that is better for cold weather. Q: Does the AWD equipment affect space? A: Cargo space is the same as in the standard Prius, but the fuel tank has shrunk from 11.3 gallons to 10.6 gallons. Q: What kind of fuel economy does the Prius AWD-e get? A: Toyota estimates the AWD-e will return 50 mpg, which still compares favorably with the standard Prius' 52 mpg and the Prius L Eco's 56 mpg. Q: Does the Prius AWD-e drive tackle weather better than the standard Prius? A: Yes. The amount of traction and stability is noticeably improved.